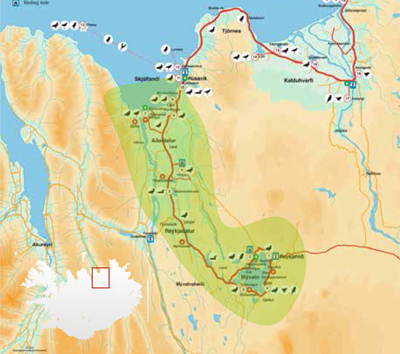 Here we focus on the area between Húsavík area (shore) to Þingeyjarsveit (valleys). Including the river Laxá with diversity of ducks and other wetland birds in few areas. This tour give also variety in scenery and nature. During the tour, we will make a stop at several places, but the itinerary (from place to place) can be slightly different after departure location. The harbour area of Húsavík include common gulls but Iceland Gulls might also be there, as well as some other rarities. Sanderling and Red Knot are common. Just south of the town of Húsavík is a lake where we can usually seen Great Northen Divers together with a good variety of wetland birds, as well as flocks of Black-headed Gulls and Arctic Terns. Leaving Húsavík area, we take a look at Ærvíkurbjarg, cliffs where Northern Fulmars are, and Common Eiders are arround. Nearby is Mýrarvatn, a lake which include usually Great Northern Divers, Common Scoters and Common Eiders. We drive through the birch covered lava field of Aðaldalur to the river Skjálfandafljót, and to the sea again, to the farm Björg. There are variety of species; seabirds and waders. On our way to Reykjadalur, we might make few stops, depends on circumstances and if the places so far have given what we expected. After accrossing Fljótsheiði we go to Laugar and take a look at small pond and wetlands. Next planned place is the lake Vestmannsvatn which include variety of ducks and usually Great Northern Divers and Slavonian Grebes. When we arrive to the river Laxá, we will look for Goosander, before we will visit the farm Hraun where is chance for close views to several species. And finish the tour at same location as departure. * The itinerary can be slightly different after departure location. ** This tour can also be organised with flight from Reykjavík.